We're excited to announce a pricing change for JIRA Service Desk. The new pricing model allows JIRA Service Desk to be purchased according to the number of service desk agents on your team, not the total user base as calculated by JIRA. All new purchases of JIRA Service Desk Cloud made on or after September 10, 2014 are on the new pricing model. Our goal is to keep things simple for you. As an existing customer, you are free to stick with your original pricing plan if it's working for you. Or, you can renew under the new pricing model. To learn more about the difference, and what will work best for you, please review the frequently asked questions (FAQ) on the New pricing model for JIRA Service Desk 2.0 FAQ page. In the previously published The Future of JIRA Agile, we have described how we intended to eventually remove Classic Boards from JIRA Agile. We are announcing that JIRA Agile 6.6 will be the last major version to ship with Classic boards. This means that Classic boards will be removed in the next major upgrade of JIRA Agile (no sooner than 60 days from the date of that JIRA Agile 6.6 is deployed). With the current board, introduced two years ago in JIRA Agile (GreenHopper) 6.0, we believe that we have a replacement that is simple, powerful and helps you to deliver higher quality products faster. We have also worked closely with customers to make sure that the usage of the original Classic boards is covered by the new Agile boards. Change is never easy and we fully understand that the removal of Classic boards may impact your team’s usage of JIRA Agile. For this reason, we have created a migration guide to assist with the transition. We strongly urge you to begin your team's migration as soon as possible. The ability to customize cards is the most popular feature request for JIRA Agile (GHS-3922). Want your team to see the Due Date, Components or other fields on cards? You can now bring the right information to your team's attention, rather than relying upon people having to view the issue details for individual issues. You can add up to three additional fields to cards. These can be different fields for Plan mode versus Work mode. Go to Board layout in your board's configuration to try it out. 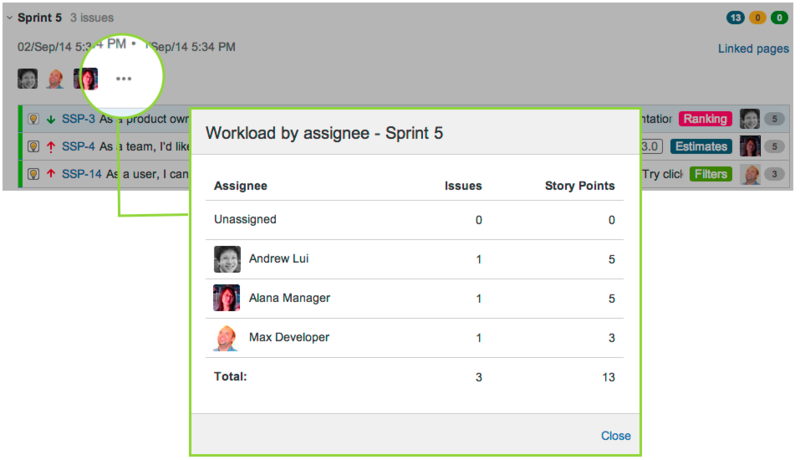 In JIRA Agile 6.5, we introduced the ability to see the assignees for issues on Plan mode of boards. This release includes a handy workload summary for each sprint that allows you to identify the workload for specialists in a Scrum team and plan accordingly. Your customers currently need to visit each individual Customer Portal to check the requests submitted in different service desks. 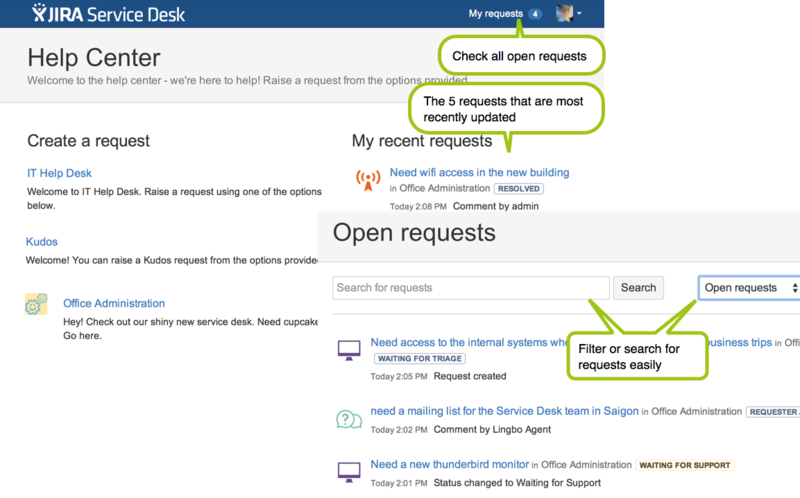 With this version of JIRA Service Desk, we've made improvements to the global portal and customers can now see all the requests in one place easily. The 5 requests that are most recently updated appear on the global customer portal by default. Your customers can now see the status of them at a glance. To check details and updates about other requests, use the My requests menu in the header. The number there indicates the number of open requests from all service desks. After clicking My requests, you will also get the option to filter requests by their status or search for a specific request. Previously, the Team Calendars plug-in for Confluence allowed you to create events and categorize them in a fixed list of event types – Travel, Leave, Birthdays, Events, and three types of JIRA events. 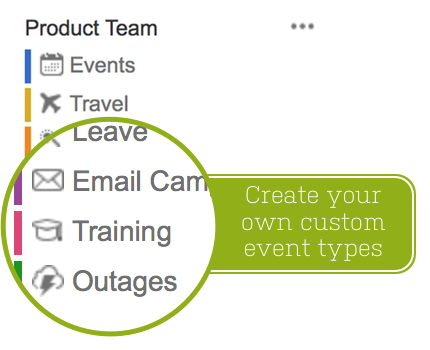 You can now create custom event types to capture those events that don't fit into one of the pre-defined types, giving you more control over how you organize your events. So go ahead and create new event types for training, email campaigns, conferences, system upgrades, working-from-home, outages, and anything else you can think of; Team Calendars can handle it.